Nearly every instrument, vintage or modern, will benefit from this modification. If your horn wasn’t one of the lucky few that was designed with high E, Side C, or Side Bb keys that solidly contact the body underneath the touchpiece, you are likely tired of your side keys being noisy and feeling mushy, sloppy and bending out of line. 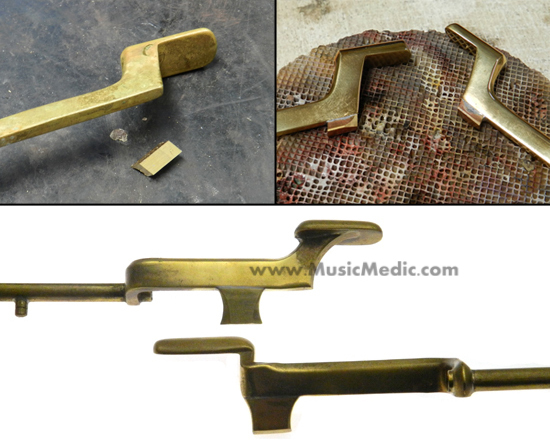 Side key contacts are custom made in the proper size, shape, and finish, according to your saxophone’s make and model. With new Side Key Contacts, you’ll enjoy quiet, solid and stable side keys. Note that the appearance of contacts will vary depending on each instrument’s configuration and clearance.